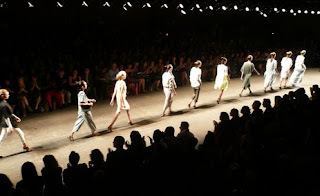 I weep when I say that New York Fashion Week ended last Thursday. Between actually being in New York City, reading up-to-the-minute Twitter and Facebook updates, and viewing LIVE feeds produced by various sources—the Fashion Week hype in the Big Apple was seriously elevated, which is quite normal for this kind of event. But at times, I couldn't keep up! Information was thrown at me in every direction possible. Can you say … information overload? However, now, I have a chance to kick back—relax—and browse through (with ease) every single designer piece, look by look, from the Spring 2011 RTW collections. And pleasssse don't bark! Trust me. I know that most of you darling are already on to London Fashion Week—I’ll get there soon. Still, feel free to reflect with me on breathtaking ready-to-wear garments that NY Fashion Week recently blessed us with. Objective: Over the next week or so I will share my ‘Top 5' pieces from a variety of S/S 2011 collections. So check back tomorrow to see who/what's on my radar!